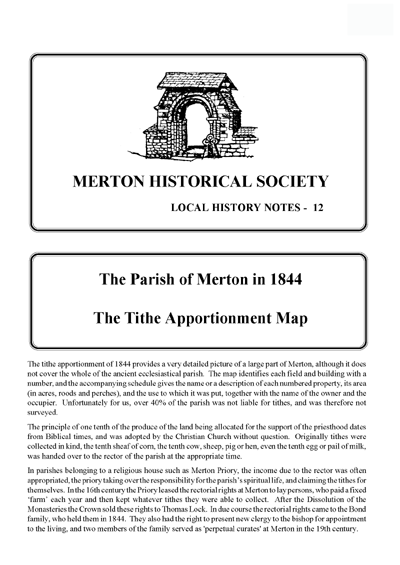 The tithe apportionment of 1844 provides a very detailed picture of a large part of Merton, although it does not cover the whole of the ancient ecclesiastical parish. The map identifies each field and building with a number, and the accompanying schedule gives the name or a description of each numbered property, its area (in acres, roods and perches), and the use to which it was put, together with the name of the owner and the occupier. Unfortunately for us, over 40% of the parish was not liable for tithes, and was therefore not surveyed. This edition follows the original apportionment by listing landowners alphabetically, with the lands then arranged by occupants. A much-reduced copy of the map is reproduced on the centre pages, followed by an extract, on a larger scale, covering the main residential centre. This is followed by an index in numerical order, giving owners and occupiers. An extract from the Post Office Directory for 1845 provides further information on some of the individuals mentioned in the apportionment, although it also overlaps into Wimbledon parish. Finally some small-scale maps are included to show the various estates of the landowners and tenants, the recipients of the rent charge, and the state of cultivation of the land. The tithe apportionment of 1844 provides a very detailed picture of a large part of Merton, although it does not cover the whole of the ancient ecclesiastical parish. for tithes, and was therefore not surveyed. handed over to the rector of the parish at the appropriate time. fixed ‘farm’ each year and then kept whatever tithes they were able to collect. After the Dissolution of the Monasteries the Crown sold these rights to Thomas Lock. living, and two members of the family served as ‘perpetual curates’ at Merton in the 19th century. lands was also often sold to the new landowners. included in the lease, and also in the later sale of the estate after the Dissolution. tenants, and their owners were entitled to demand the tithes as well as the rents. extinguished, upon payment of a lump sum. These exempt lands totalled 689 acres 1 rood 33 perches. They were not surveyed for the map and are not listed on the Tithe Apportionment. These lands are included in the tithe apportionment and on the map. properties, selling 182 to Benjamin Burt and 108 to Thomas Robert Dutton. by Non-conformists and Roman Catholics. assuming that each sum had been used to purchase equal quantities of wheat, barley and oats at prices published annually in the London Gazette. accompanied the commutation of tithes remain an important source for the study of local history. the recipients of the rent charge, and the state of cultivation of the land. No. Cultivation	A	R	P	£	s.	d.
This entry was posted in Publications, Local History Notes and tagged in lhn, merton, tithe, transcript.